The Eddies - "Gonna Sing About This" ep made this top 10 list for albums in 2013. Twist Records releases a new version of The Eddies - Debbie Jones In Space Y Remix. The Eddies are back with a new 3 song single called "Gonna Sing About This" engineered, mixed and mastered by Earle Mankey, just released on Twist Records. It is available from Jam Records, Kool Kat Musik, Detour Records, cd Baby, iTunes, etc. The Eddies have added drummer extraordinaire Len Curiel (ex. Huntington Cads, The Organization) whose drum talents are featured on this single. Len has also played with Davie Allan, The Loons and The Monks. Coming soon: a new recording and mix of Squire's "Debbie Jones". Also coming soon on Blindspot Records "Remember The Lightning a tribute to 20/20" produced by The Eddies Dean Hoth and Bart Mendoza of Manual Scan and The Shambles. This will feature The Eddies doing their version of 20/20's "Nuclear Boy". Stay tuned, more details to follow. Out now The Eddies - "It's Christmas Time Again" digital single on Twist Records available from iTunes, Amazon, Rhapsody, CD Baby and all the usual online distributors. Also Power Chords, Harmonies and Mistletoe - A Twist Records Christmas Collection (a various artists mod power pop Christmas compilation) produced by The Eddies Dean Hoth. Available from JAM Records, Kool Kat Musik, Detour Records and CD Baby. Coming soon from The Eddies- a new single featuring duets with Twist Records founder and The Risk front man Mark Le Gallez and Bart Mendoza of The Shambles and Manual Scan. The Eddies wish all a Very Happy, Healthy, Prosperous and Successful New Year! New upcoming projects: The Eddies will be featured on "Do you Wanna Be In The Show: A Tribute To The Jetset" cd due out on Twist Records March 2009. 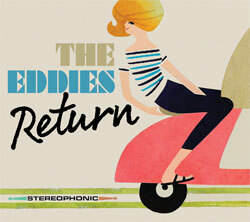 The Eddies new single will also be released in March on Twist Records. It features dual lead vocals from Dean and Rob Griffiths of The Little Murders fame. The Eddies are also looking forward to appearing on future tribute cds to The Risk and 20/20. The Eddies will be available at Target soon! Shop Twice Around The World and In The Sunshine. The Eddies new cd "Twice Around The World" is now available all over the internet from CD Baby, Yahoo! Music Match, Apple iTunes, Napster, Amazon, Rhapsody, MP3 Tunes, AOL Music Net, Jam Records, Kool Kat Records, and lots of other places. Thank you for your continued support! The Eddies would like to wish everyone a very Happy, Healthy, and Prosperous New Year! Thank you so much for your continued support of us and our music. The Eddies second full length cd 'Twice Around The World' will be released by Twist Records February 4th 2008. Check out the discography page to check out this new cd. The Eddies have finished recording their second album. It is currently being mixed and mastered. Look for an October release date. More details to come soon. Check out the discography page to listen to "Debbie Jones". The Squire Tribute is now released and available from Detour Records www.detour-records.co.uk and Jam Records www.jamrecordings.com. It features The Eddies "Debbie Jones". The Eddies want to wish everyone a very Happy, Healthy, Prosperous and Blessed New Year! New reviews in from ModRadioUK.com. Check out the reviews page and the new link to ModRadio Uk.com on the links page. The Eddies - "Modern Music For Modern Times" reviewed in Scootering Magazine's 21st Anniversary Issue. Check out the reviews page. The Eddies are recording a cover of The Times - "Red With Purple Flashes". The "Stranger In The House" single has been cancelled. Instead, Twist Records will be releasing a full length cd featuring all of The Eddies mod covers! This will include "Red With Purple Flashes" and "Stranger In The House". The Eddies are in the studio recording a new song "Stranger In The House" featuring Rob Griffiths of The Little Murders on lead vocals. Look for "Stranger..." to be released on the upcoming Eddies single to be released on Twist Records. Check out the official Secret Affair link added to the links page. We are proud to say that The Eddies can now be heard around the world. Here's the current list of the countries where our music is available and heard: USA, Guernsey--Channel Islands, Germany, England, France, Spain, Portugal, Ireland, Scotland, Japan, Indonesia, Uzbekistan, Russia, Turkey, Yugoslavia, Serbia & Montenegro, Canada, Sweden and Australia. Our new single is out this week! It features a cover of Squire's "Debbie Jones", the Risk's "Good Times", and the Jetsets "Colour My World"
The Eddies will be featured on Howitzer Records upcoming compilation CD titled "News of the World"
NEW T-shirts! We had new T-shirts made with the NEW Eddies logo. They'll be for sale later in the month. Please check either one of our sites for updated information on how you can get your new shirt. The Eddies have recorded a cover of Manual Scan's, "Don't Know Where to Start" that will be featured on a Hurricane Katrina Tribute album that's being put out by JAM Records. In the Sunshine, the Eddies' first album is now for sale all over the internet from CDBaby (click here), Yahoo! Music Match, MSN Music, Apple iTunes, Napster, Amazon, Rhapsody, MP3 Tunes, AOL Music Net, and many others. The Eddies would like to wish everyone a Merry Christmas, a Happy Holiday Season and a Prosperous New Year! Thank You for your continued support of us and our music. The Eddies are in the studio recording their 2nd album; their new single "Modern Music for Modern Times" will be released soon. The Eddies are also recording the music for "Don't Know Where to Start" for the Manual Scan Tribute album. They will be the backing band for Mark LeGallez of The Risk on lead vocals. The Squire Tribute from Twist Records will be released in time for Christmas. The Eddies have more tributes planned with Twist Records in the future--the Tribute to The Jetset due in early 2006--as well as a Christmas Compilation album and a tribute to The Risk. The Eddies new single "Modern Music for Modern Times" is due out in July 2005 on Twist Records. 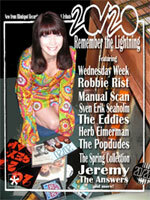 "In The Sunshine" cd reviewed in this month's Scootering Magazine and by Capitol Records. Check out the reviews page for these. Squire tribute cd new release date � September 2005. The Eddies are recording a cover of The Monkees "You Just May Be The One" for the Michael Nesmith tribute cd. The Eddies have just finished recording a cover of The Jetset’s “Colour My World” which will be coming out on their new single due out in April 2005 on Twist Records. This year will be a busy year for The Eddies. The Eddies have signed on to contribute songs for tribute cds for: The Risk, The Jetset, Michael Nesmith (of The Monkees) , and a various artists Mod/Power Pop Christmas. A new album is planned for this year as well. More information and details coming soon. Squire tribute cd due out Twist Records May 2005. Artists include The Eddies, The Shambles, Yeh Yeh, The Little Murders, Paul Bevoir (The Jetset), Mega Super Ultra, The Che Men (Afterglow), Jeremy, The Relatives, Mod Fun, The Spring Collection, The Shingles, The Vagabonds, Buddy Woodward (Lost Patrol), Bob Andrews (Beat Direction), Smodati, and The Deceivers. The cd will be mixed by the legendary Earle Mankey. Bart Mendoza of The Shambles will be writing the liner notes and Paul Bevoir of The Jetset will be doing the artwork. The Eddies are looking forward to a songwriting collaboration with Rob Griffiths of The Little Murders. Stay tuned. The Eddies have finished recording “Debbie Jones” for the upcoming Squire tribute cd coming out on Twist Records - March 2005. The Eddies have also finished recording “Sweet Caroline” for the upcoming Neil Diamond tribute coming out on Delirium Records – February 2005. The band is currently recording a cover of The Risk “Good Times” for the Shout compilation coming out on Biff!Bang!Pow! Records – January 2005. Also the band has parted ways with drummer Cris Cordero. Famed producer Earle Mankey has taken over on drums. "In The Sunshine" cd sells out of it's first pressing!